Greatest Show on Earth - by Jon Simonds, The Basically Brooklyn Series. The most twisted version of Snow White and the Seven Dwarves has thankfully packed their bags and headed down the pike to South Carolina following a successful run in the Granite State theatre of New Hampshire. Donald Trump in his Academy-worthy portrayal as Grumpy promising to make "America Great Again," is banking on carrying this monumental tune all the way to Cleveland, Ohio's third hosting of the Republican National Convention in July. Why the RNC picked Cleveland, also known as the mistake by the lake, is as big a mystery to me as the Republican support of Grumpy. I'm all for making America great again. I'm just not sure banning Muslims and building a wall (unless, of course, you work in the construction industry) is going to solve America's problems. Ted Cruz, who shined as Dopey in Iowa, fell hard to the critics throughout the stages of New Hampshire, while Marco Rubio in his portrayal as the Huntsman promising to save America from the frosty Sleeping Beauty and her overly confident performance for that other party, fell behind his mentor Doc, played by Jeb Bush. Originally, Ben Carson was slated for the role, but the fickle finger of fate made him a natural for Sleepy. Does he always close his eyes when he’s speaking? Early primary returns, as of this writing, have him so sleepy, New Hampshire voters preferred the Evil Queen played by Carly Fiorina, nearly 2-1. Perhaps the biggest winners in the Granite State were none other than Chris Christie in his role as the red-faced Bashful and John Kasich playing Happy. Nobody would be happier than the folks of Cleveland, Ohio if the Ohio native can carry these rave reviews all the way to the nominating process in the Buckeye State. In spite of giving us the Cleveland Browns, when it comes to Presidential politics, 1 of every 6 Presidents is from the good State of Ohio. The shame of this insane primary season is the lack of a game plan addressing the real problem with America: the near extinction of the middle-class. 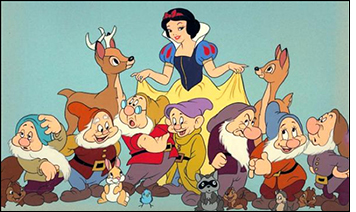 The Prince, in this nutty remake of Snow White and the Seven Dwarves is pushing socialist ideology as the only way to save the middle class. He is demonizing the banks and Wall Street for enriching the rich while driving hard working families into the ground. On the surface, this all sounds and looks terribly real but the real causes behind the demise of America's driving force, it's middle class, aren't as simple as all that. Technology and a global economy are destroying us. Factories are growing world wide and companies like Nike are selling $100 dollar sneakers made by a workforce averaging $40 bucks a week. America can't compete with that, or can we? Our dollar is still the strongest currency in the world. Surely we can use it against cheap labor in an effort to raise the standard of living to what we are accustomed to, rather than the continual decent of our own.